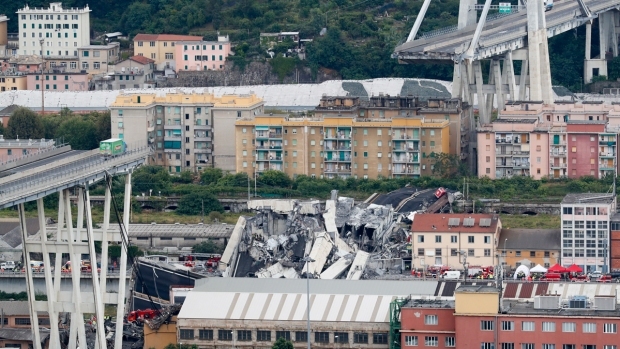 A 51-year-old highway bridge in the Italian port city of Genoa collapsed in a driving rain Tuesday, killing at least 39 people and injuring 15 others as it sent dozens of vehicles tumbling into a heap of concrete and twisted steel. Italian Premier Giuseppe Conte called it "an immense tragedy ... inconceivable in a modern system like ours, a modern country." The disaster, on a major interchange connecting Genoa and other northern cities with beaches in eastern Liguria into France, focused attention on Italy's aging infrastructure, particularly its concrete bridges and viaducts built in the postwar boom of the 1950s and 1960s. What caused the Morandi Bridge to fall remained unknown, and prosecutors said they were opening an investigation but had not identified any targets. Transport Minister Danilo Toninelli said the collapse was "unacceptable" and that if negligence played a role "whoever made a mistake must pay." Early speculation focused on the structural weakness of the span. Witnesses reported hearing a roar as the 45-meter (nearly 150-foot) bridge collapsed in a torrential rain during midday traffic on the eve of a major holiday that sees most Italians abandoning cities for beaches and mountains. One unidentified woman who was standing below told RAI state TV that it crumbled as if it were a mound of baking flour. Video of the collapse, showing a misty scene of crumbled concrete, captured a man screaming: "Oh, God! Oh, God!" 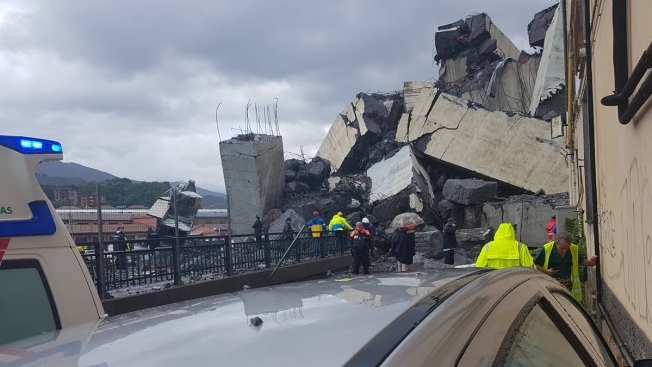 Civil Protection authorities said at least 30 cars and three heavy vehicles were on the 80-meter (260-foot) section of the span that collapsed in the industrial area of warehouses. There was an immense gap where the bridge used to be, and one heart-stopping image showed a green truck halted on the rain-slickened roadway just short of the edge. A man who was standing under the bridge in front of his truck at the time of the collapse called it "a miracle" that he survived. The middle-aged man, who did not give his name, said the shockwave sent him flying over 10 meters (33 feet) into a wall, injuring his right shoulder and hip. "I was in front of the truck and flew away, like everything else. Yes, I think it's a miracle. I don't know what to say. I'm out of words," he said, walking away from the site. More than 300 rescue workers and canine crews were on the scene. They used heavy equipment and dogs to search for survivors in the rubble. At least four people were pulled alive from vehicles under the bridge, ANSA reported. "Operations are ongoing to extract people imprisoned below parts of the bridge and twisted metal," said Angelo Borrelli, the head of Italy's civil protection agency. Officials evacuated several hundred people living along the raised highway that traverses the city as a precaution. The effort would continue into the night. "It is a bit like working on an earthquake," said firefighters spokesman Luca Cari. "The main difficulty is removing the rubble and safeguarding the rescue teams." There was confusion over the death toll throughout the day, with different officials giving conflicting numbers. After visiting the scene, Conte told RAI state TV the tragedy was "a serious wound for Genoa, Liguria and Italy." The Italian CNR civil engineering society said that structures dating from when the Morandi Bridge was built had surpassed their lifespan. It called for a "Marshall Plan" to repair or replace tens of thousands of bridges and viaducts built in the 1950s and 1960s. Updating and reinforcing the bridges would be more expensive than destroying and rebuilding them with technology that could last a century. They cited previous accidents: a bridge that fell in April 2017 in the northern province of Cuneo, crushing a carabinieri police car after the officers and driver had barely managed to get away in time; and an overpass that in the northern city of Lecco that collapsed under exceptional weight, crushing a car and killing the driver. The design of the bridge has been criticized in the past. Antonio Brencich, a professor specializing in reinforced concrete construction at the University of Genoa, called the span "a failure of engineering" in an interview in 2016. "That bridge is wrong. Sooner or later it will have to be replaced. I do not know when. But there will be a time when the cost of maintenance will be higher than a replacement," he told Italian media Primocanale. Other engineers said corrosion or weather conditions could have contributed. "As this reinforced and pre-stressed concrete bridge has been there for 50 years, it is possible that corrosion of tendons or reinforcement may be a contributory factor," said Ian Firth, former president of The Institution of Structural Engineers, a London-based international network. He called the bridge "an unusual design." Mehdi Kashani, an associate professor in structural mechanics at the University of Southampton in the U.K., said maintenance issues and pressure from "dynamic loads," such as traffic and wind, could have resulted in "fatigue damage in bridge components." Borrelli said highway engineers were checking other parts of the bridge and that some areas were evacuated as a precaution. "You can see there are very big portions of the bridge (that collapsed). We need to remove all of the rubble to ascertain that all of the people have been reached," he said. The transport minister, Toninelli, said the company that has the concession to operate that section of highway said its maintenance on the bridge was up to date and no work was being done at the time of the collapse. But he added that they were about to launch a 20 million euro ($22.7 million) bidding process for significant safety work on the bridge. "There has not been sufficient maintenance and checks, and safety work for many bridges and viaducts and bridges in Italy constructed — almost all — during the 1960s," he said. It was the second deadly disaster on an Italian highway in as many weeks. On Aug. 6, a tanker truck carrying a highly flammable gas exploded after rear-ending a stopped truck and getting hit from behind near the northern city of Bologna. The accident killed one person, injured dozens and blew apart a section of a raised eight-lane highway.